MAMADOU NDIAYE grew up in Senegal. His parents were “not poor, but not rich”. He was fascinated by mathematics, which he studied at Cheikh Anta Diop University in Dakar and then taught for several years in Côte d’Ivoire, saving to pursue his dream of studying in America.He went to New York, where he worked at Staples, an office-supplies chain, to finance his masters in statistics at Columbia University. A customer, impressed by Mr Ndiaye’s sales advice, suggested that the Senegalese apply for a job with his own employer, IBM. That was 15 years ago. Now Mr Ndiaye is back home, as manager of the office Big Blue opened in Dakar last May. The office in Senegal is just one sign that IBM believes Africa will bring in billions. It is no newcomer: it sold its first gear there to South Africa’s railways in 1911 and a mainframe computer to Ghana’s central statistics bureau in 1964. Lately it has been paying special attention to the continent. In July 2011 it won a 10-year, $1.5 billion contract to provide Bharti Airtel, an Indian mobile-phone company, with information-technology services in 16 African countries. Since mid-2011 it has set up shop in Angola, Mauritius and Tanzania, as well as Senegal. In all, it boasts a presence in more than 20 of Africa’s 54 countries. Last August it opened a research lab in Nairobi, one of only 12 in the world. And between February 5th and 7th Ginni Rometty, its chief executive, and all who report directly to her met dozens of African customers, actual and prospective, in Johannesburg and the Kenyan capital. It was, Mrs Rometty said, the first time the whole top brass had assembled outside New York since she became the boss just over a year ago. Mark Walker of IDC, a research firm, says that in the past three or four years multinational companies have adopted a “completely fresh approach”. They have “a lot more skin in the game: investing in local people, so there’s proper knowledge transfer, investing in country offices.” Companies are in it for the long term now, rather than quitting after a bad quarter or two. The Nairobi lab is expected to earn its keep quickly. The Chinese and Indian labs, Mr Kelly says, took 10 years to make a significant contribution technically and commercially. Kenya’s target is five. He says the lab has made a good start, drawing on work by an older sibling in Tokyo to tackle its traffic problem. To Westerners, “mobile banking” is a new way of doing something old. To many Africans, it is the obvious way of doing something new. In Kenya M-PESA, a system of transferring money over phones, is an everyday, reliable utility. Equity Bank, a fast-growing bank, most of whose customers have never had an account before, has come of age with mobile technology: its chief executive, James Mwangi, says his customers can use any of its 54 products on the move. For technology companies, all this means a growing demand for many things: reliable connectivity; software; analysis of data on spending, lending and repayment; and data centres. Mr Kelly sees an opportunity “for Africa to move, and move first, to this new era of computing.” It can leapfrog straight to the tech frontier, without worrying about adapting old systems to cope with the data it creates. At the Catholic University of Eastern Africa, which will eventually be the new lab’s home, a Kenyan asked Mr Kelly, “Will you bring Watson to Africa?” Yes, he replied, if someone suggests a problem for it to solve. Mr Ndemo spoke up: “Let us bring Watson here in nine months.” Africa has plenty of problems. 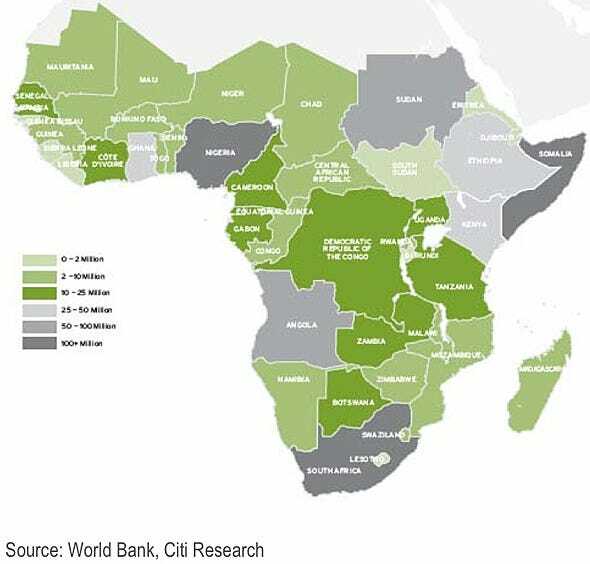 Computing power can help Africans solve them.